Due to the solid properties of concrete, this type of flooring can play hell with your feet when stepping on them over extended periods of time. This is particularly true for construction workers, for example, when long hours are spent on concrete with heavy loads. Having the right pair of boots with sufficient load-bearing protection can help to reduce this load, vastly reducing aches and pains that can be caused by cheap or poorly-designed footwear. This boot from Irish Setter has been around for well over 5 years but continues to garner positive feedback from those in heavy industries as a tough and durable form of footwear. Despite a premium build quality, this is still an affordable boot at around the mid-range price of the market. 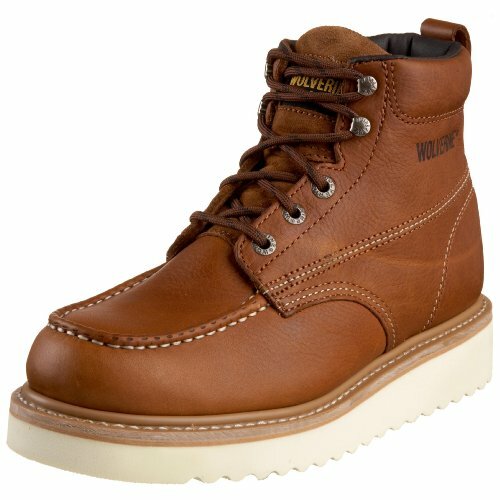 The Irish Setter Work Boot is designed from natural leather, with a tough, all-weather rubber sole. Measurement from the arch is around 5.5-inches, with the opening measuring around 13.5-inches. The boot meets ASTM F2413-11 Safety Standards in case this is required on-site. Despite the durable, leather build quality of these tough boots, they still manage to be lightweight, making them easy to walk in without tiring. The boots also offer full support, completely gripping the ankle and heel in all the right places to prevent chafing. High-quality laces and eyelets help to prevent wear and tear of lace fabrics over time. Though the grip on these soles is good, they perform better on dry surfaces, but lose some friction on wet ground. This is the only real drawback to speak of. Other smaller, less problematic points to mention are that the sizes tend to be 0.5-1 size larger than advertised, plus they’ll take some wearing-in to become super-comfortable. 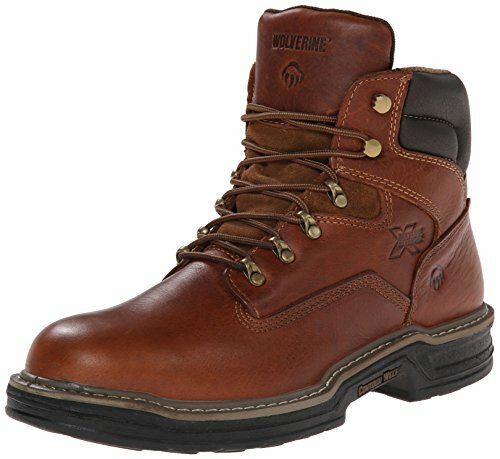 The Wolverine Raider Boot is around mid-range in terms of both price tag and build quality. It has been around 10 years in the market, with both more expensive and cheaper boots available within the Wolverine brand. These boots incorporate the Wolverine Multishox Individual Comfort System, using multiple compression pads to absorb impacts and return energy. There's also a 30-day comfort guarantee. In terms of specifications, the shaft measures at around 5.5-inches from the arch, and the heel 1.25-inches. The platform is approximately 0.75-inches. 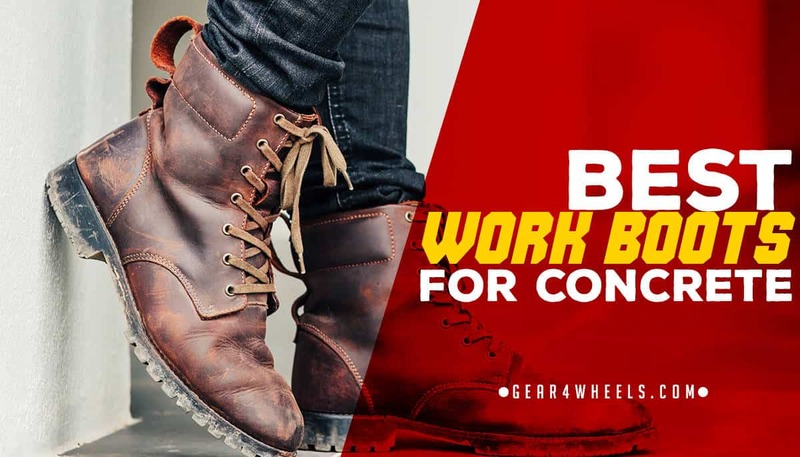 It doesn’t take long for these boots to become broken in and more comfortable, plus the shock-absorbing pads help to soften impacts on hard concrete ground. 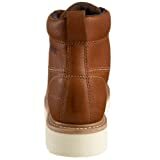 What’s more, the leather is extremely flexible, helping to improve comfort and reduce or stop any pinching around the ankle, heel, and other pressure points in the foot. A frequent problem with the sizing on these boots is that it’s often slightly out in either direction, either too wide or too narrow. This has a small impact on the comfort of the boots. The tread also provides little grip on wet surfaces, and the material used for the shoe strings tends to wear more quickly than you’d expect. Like the Timberland boots that we've looked at, this pair of boots has also been around for well over 10 years and is one of the cheapest on our recommended list. Though they aren’t the best-quality product, they’re good value for your money, with features that aren’t always seen at this price point, such as a reinforced toe and water resistance. These unlined boots feature a removable full-cushion foot bed for enhanced support and energy transfer, with a lightweight nylon shank that helps to reduce foot fatigue. An optional steel toe is rated ASTM Fs413-11 M I/75 C/75 EH compliant. For a relatively inexpensive product, it’s surprising that these boots have a fair level of water resistance, although this benefit is partially reduced by the fact that these boots don’t perform too well on wet ground. That said, traction on all other surfaces is strong. These boots have the common issue of having a slippery underside when walking on wet or slick surfaces. They also typically tend to widen over time, making them a looser fit. Finally, the sizes are usually slightly off; you may need to purchase one size higher than required in some cases. As a brand, Timberland has been around for a considerable amount of time, with this specific model of boot existing on the market for well over 10 years. 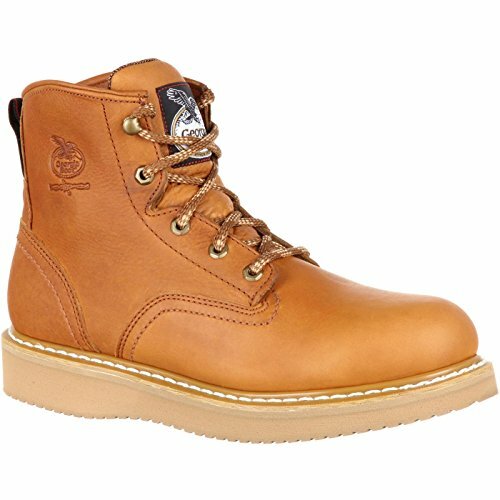 Timberland offer a 30-day comfort guarantee, combined with anti-fatigue technology. Measurements inside of these boots are 5.5-inches from the arch, and around 1.75-inches in the heel. An abrasion-resistant double rubber-coated steel toe increases protection against wear, and the underside features a puncture-resistant plate for protection against sharp foreign objects. A mesh antimicrobial lining helps to guard against unpleasant odor. 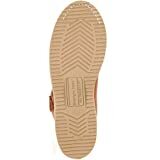 Timberland’s brand produces high-quality and attractive boots; this breed of leather has been colored with an attractive, deep brown, with highlights. In terms of structural protection, there’s a steel toe capped with a double rubber layer, and the boots have good water resistance. 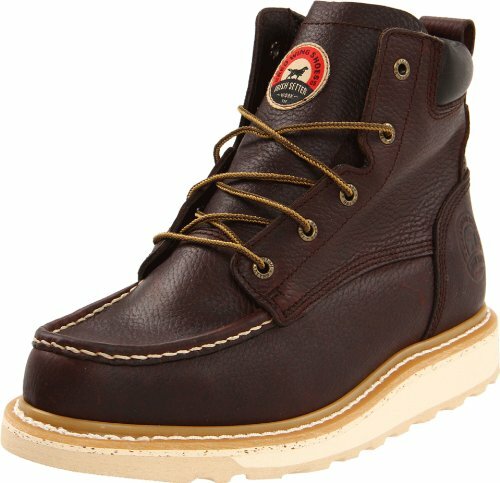 Timberland boots are known for being more expensive than most other brands. This pair is also heavy, which can tire the legs more quickly on long shifts. Lastly, there’s no elastic keeping the tongue centered, so it tends to slip to one side. Georgia Boot is a well-known producer of quality footwear for practical uses, which are durable, yet comfortable. Around since 2012, the 6-inch Wedge Work Boot is a mid-range boot with little-to-no breaking-in period. This product is built from SPR leather, which has 3 times the strength of traditional leathers, as well as nearly 3 times as much abrasion resistance. It also has resistance to certain acids and caustic chemical compounds. Measurements are as follows: the shaft is approximately 6-inches from the arch, with a weight of around 3.5 pounds (size 10 baseline). One of the remarkable things about this boot is that is has practically no breaking-in period; the boots are comfortable straight out of the box, with a firm yet comfortable grip. They’re also super-easy to slip on without resistance. What’s more, the wedge outsole is oil-resistant, offering greater protection to the footwear when on a job site. In most cases, the size specified is a half-size too big. In terms of the design itself, there’s a lack of traction on the underside, reducing grip on wet surfaces, and the stitching inside of the heel can cause rubbing and chafing. 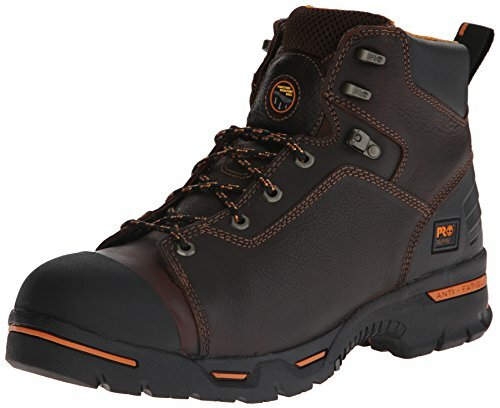 From our list above, we simply must recommend the Irish Setter Work Boot. Although we’ve also looked at Timberland boots, which are well-known for quality, they’re also very expensive. The Irish Setter boots are affordable, yet with many of the same features, as well as strong durability and exceptional comfort.